I would much prefer (in the future) to drive if I am going to do a large overland trip. In that way, you can stop and examine things and have the iternary in your control, rather than under the control of the train schedule. I would take trains, but probably just overnight (8 - 10 hours), and not count on them providing a great way to see things. The trains were comfortable enough. It is a little weird sleeping in a cabin with three people you don't know, and the constant noise and motion could be a sleep issue to some people. Having a food car on the trains were in no means guaranteed. Even then, the food was on the expensive side. 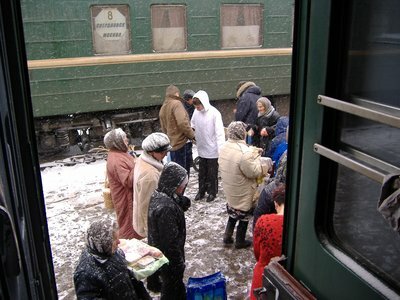 At all stops in Russia there were people selling food on the platforms, which was good and inexpensive. Most of it was meat in pastry or dried fish, so vegetarians may have some issues. At other stations, there was usually a shop or restaurant in the station. Hot water is always available, so self-catering is a good idea. Lots of people eating lots of "just add water" noodles. The train ride from Moscow into the Urals is alright if you like Pine and Birch forests intrupted by industrial wastelands. As you climb into the Urals (very low lying at the point the train goes through), we started to get snow and more forests and less industry. We did cross the Volga river, which was neat to see. After leaving the Urals, you enter Siberian plains. It's a lot of forests, open grass plains and boggy, swampy areas. I didn't see much in the way of wild-life, as I imagine they are in the forests and keeping a low profile. Approaching Irkutsk the land starts to get hillier heading up towards Lake Baikal. Baikal is a long, thin but very deep lake, holding one-fifth of the world's fresh water. Heading down through Mongolia you get more grass plains. Wild horses can be seen, as well as herds of cows and sheeps. The occasional ger is sited. After Ulaan Baatar, you start to enter the Gobi desert. It's a rocky, sandy desert with tufts of dry grass. Horses, cows and sheep are still scene, but the occasional camel is added into the mix. The desert continues into China. After Jining, the desert ends and you get into Chinese agriculture and mountains. Getting towards Beijing, lots of good views of the Great Wall can be found in between long, dark stretchs through tunnels. I didn't get to see much of the cities, but here are my quick impressions. Brussels, Belgium - nice city, and interesting mix of old buildings and new office towers, but it fits together nicely. Beer is really cheap as compared to Paris, and so much good beer is made in Belgium, which is a plus. I stayed that the Hotel Sabina, which was nicely located, but the rooms were drab, small and prision like. I paid $US 56 for the night. 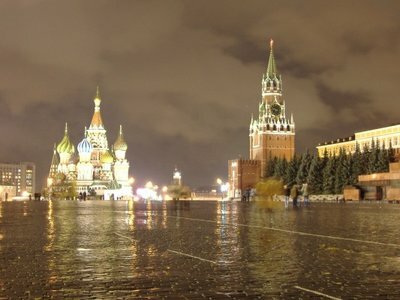 Moscow, Russia - very interesting city. Red Square is very cool. 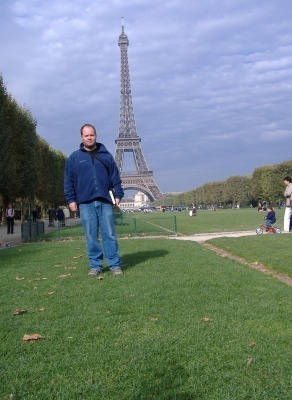 I couldn't figure out how to get into the Kremlin, there was a line but it never moved. I was amazed at how many high-end shops there were in Moscow - they seem to have taken to the shopping aspects of captialism very well. I stayed at the Tourist Hotel near the botanical gardens metro stop. Around $US 70 a night. It was a nice enough hotel, but far from the city centre. There were a large number of buildings on the property and I couldn't figure out what they were all for. There was a store where I stocked up on supplies before getting on the train. Irkutsk, Russia - like a wild west frontier town. The weather was beautiful - sunny and around 10 degrees. Very un-Siberian I thought, for late October. Irkutsk is a good base for lots of activities around Lake Baikal (rafting, boating, fishing). Food is inexpensive. There is somewhat of an irony in walking down Marx street and seeing all the high end clothing stores. Ulaan Baatar, Mongolia - a very interesting mix of gers, wood shacks and drab soviet style buildings. Nice main square, and the large Gandantegchinlen Khid monastery and the winter palace of the Mongol Khans are worth a look, though not the fee to take pictures. Lots of mutton available to eat. Many people use Ulaan Baatar as a setting off place for trips into the Gobi desert. Whatever you do, don't give your passport to the police. It's a shake down, which I unfortunately feel victim too. Three police officers accused me of being drunk (which I was, but I don't think that's a crime) and started harrassing me. They searched me and took everything off me. I had been warned that the police do this, and it's really an extortion attempt. I was pretty sure I was going to have to pay to get out of it. Beijing, China - Tons of construction cranes dot the skyline of Beijing as they prepare for the 2008 Olympics. The hutong (all the little alleys that hold the small houses) is quickly disappearing as Beijing builds high rise apartments and office buildings and street wide enough for cars. I stayed at the Bamboo Garden Hotel near the Golou metro stop. Amazing place! It was around $US 70 a night. It's a first rate establishment, built around a courtyard that once housed the Empress' eunuchs. There are quiet pools to sit by for reflection, a restaurant, tea room and bar, and (most importantly) hot water in the showers! The room is fantastic, including free HBO and a James Bond-like control panel to control and lights that folds up into the night stand to disguise itself as a drawer when not being used. Also, be wary of students practicing English with you. I meet a couple of students who wanted to practice English with me. They showed me around for a couple of hours, and then we went to see a tea ceremony. The bill came and it was for $330, which the students didn't have. I paid, and then we went out to dinner. I didn't even realize it was a scam until I read about it a few days later. They worked 5 hours for the money! Also, I was approached twice by English speakers who were "art students" and wanted to show me their work. Hong Kong, China - well, at least kind of China. Mountains and ocean, with gleaming high rise towers in between. I loved this city. I hiked up to Victoria Peak and watched the sun go down and the sky-scrapper lights start to come on. Really cool. I stayed at the Marriott Rennaisance Harbour View Hotel using my Marriott Rewards points. It's very nice, but hardly budget. It's right by the Wan Chai metro stop, which also has a lot of bars, restaurants and "strip clubs." I didn't go in, but apparently the strip clubs are very shady, and I have heard of people being drugged in them. The bars seemed fine. The crossing from Russia to Mongolia is very long, though, taking upwards of 8 or 9 hours, so don't plan much for that day. In Russia, learn the sounds that the letters of the Cyrillic alphabet make. Metro stops, train stations and street names are not printed using the English alphabet, but maps tend to put things in English letters, so to translate between the two you need to know that tuhhelb is prounounced tunnel, and stuff like that. Plus, a lot of the words that travellers would need to know are pronounced the same or very similar. Tourist, restaurant, bar, cafe, toilet, and bank are just some of the words that are very similar, so if you can read a little Cyrillic, you can figure out that Pectopah = Restoran. Mongolian uses the Cyrillic alphabet too, but the words are somewhat different. Many things in Mongolia are also printed in English. Few people speak it, but pointing and smiling can get you pretty far. For Paris - Brussels, you can buy the tickets on the Thalys TGV site. Standard prices is 71 Euros, but discounts can be found if travel is flexible, or departure point. I saw one deal that was 15 Euros from Charles De Gaulle airport to Brussels. I bought the Brussels - Moscow tickets on line from Die Bahn for 229.5 Euros. For the Moscow - Hong Kong portion, I purchased on line with a company called Sokol Tours. I found them to be the cheapest after spending 6 hours or so looking. They charged me about $US 1000 for the tickets. However, the ticket prices were printed on the tickets, and thus if you wanted to try and buy the tickets yourself you might get a much better deal. However, trying to deal with ticket agents without language skills could be a problem. Some people who purchased tickets were charged extra fees in addition to the ones listed on the tickets. Paris - Brussels = 71 Euros or $US 83.54 for seat. Your blog is brilliant !! I love the pics and found the price and border information really interesting when trying to work out budgets for some places. Lovely! How very Paul Theroux-ish. Been saving up for an HK to Moscow by train trip too. Very funny really. How did you manage to get tricked into it? Wasn´nt it obvious? I fell for it because of the work they put into it, and the fact that I was feeling in a trusting and open mood. It was a good hour and a half before we went to the tea house, and they spent time with me after, which eased any fears I had. No big loss, really. The trip had been pretty cheap up to then. Great in depth report of your trip! I enjoyed reading it! Hey Greg, I found your report really interesting. I've been digging up for this sort of information on the web for the last few weeks and I think yours was the best. I'm planning to make a similar trip next year so if you don't mind, when I've made my mind more clear, I might contact you to ask you some questions. Take care! I'm so envy. You travel alot more than i've in my whole life. so sorry that u met those 3 policemen in ulaanbaatar. shame on them. otherwise, mongolia is a great place to visit, isn't it? Nice post and very awesome photos.I liked the post and appreciate for sharing such a nice post.